Some years ago, as a friend’s mother was recounting the events of her Mediterranean cruise, she described Greek customs officials coming on the boat in Athens: “They went through everything, they were like the goddamned gazpacho.” It works best in a Texas accent, but in any event, it forever branded this cooling Spanish soup as “the goddamned gazpacho” for me. A cold soup of raw vegetables, gazpacho goes back to the Roman times, though some accounts give it a Moorish origin. The original recipes call for a blend of garlic, bread, water, vinegar, oil, and salt pounded together in a mortar. Classified by color, it’s most often made with red, tomato base, though there are white and green variations. I looked at what I had from the market and decided to go green. When I read the list of ingredients to Anita, she said, “That’s an awful lot of things, I think you should cut it down.” I’ll leave that for you to decide (as I say in the Notes on Ingredients below), but it is sort of a mix-and-match list. 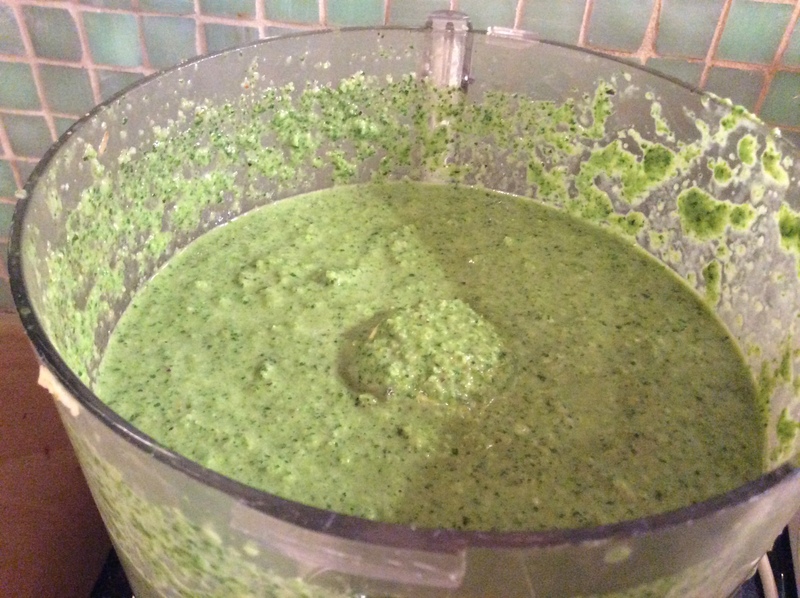 If there was a starting point, it was Yotam Ottolenghi’s green gazpacho recipe in Plenty , though that was really more of starting point than an actual recipe. 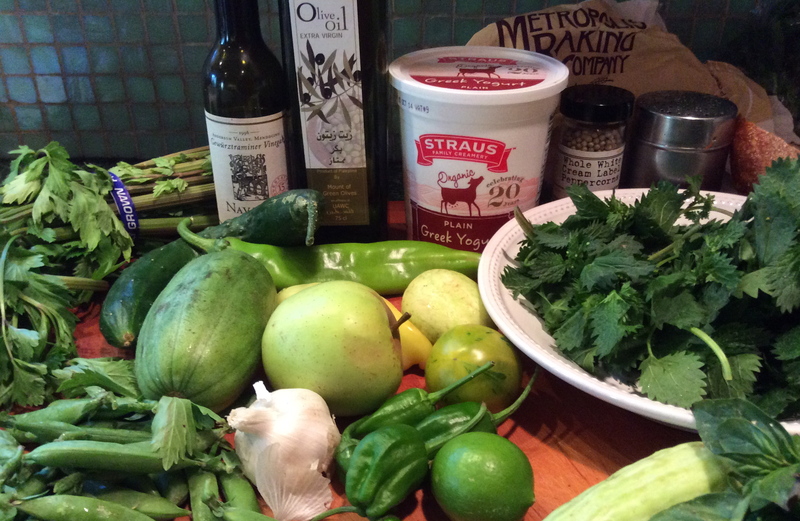 What I had was some red celery, nettles, basil, and Caroselli (a sort of melon/cucumber cross) from Annabelle Lenderink’s La Tercera. 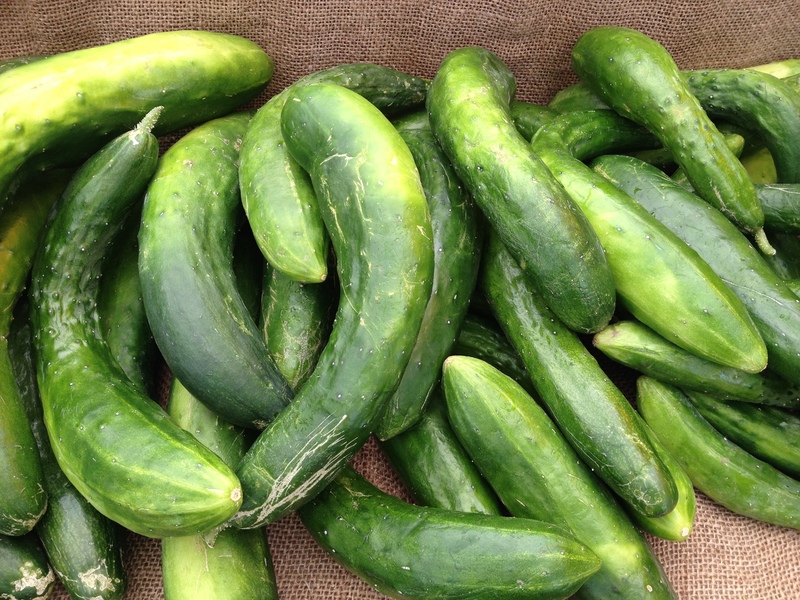 The garlic and cukes came from Alice at Moon Fox Farm. I picked up the lemon cucumbers and padron chiles from Quetzal Farm. A Golden Delicious apple came from Pomo Tierra Ranch. The lime came from Ram Das, the vinegar from Navarro Vineyards and Winery, the sugar snap peas from Swanton Berry Farm, and spices from Oaktown Spice Shop. The rest sort of filled itself in. In addition to color variations, gazpachos come in varying consistencies. The first couple of times I made this dish, I used a food processor. It was a little rough, so I decided to go with a second mix in the blender—though if you’ve got one of those fancy big blenders you could do it all there. Blanch the nettles and sugar snap peas, and put in cold water to set color. 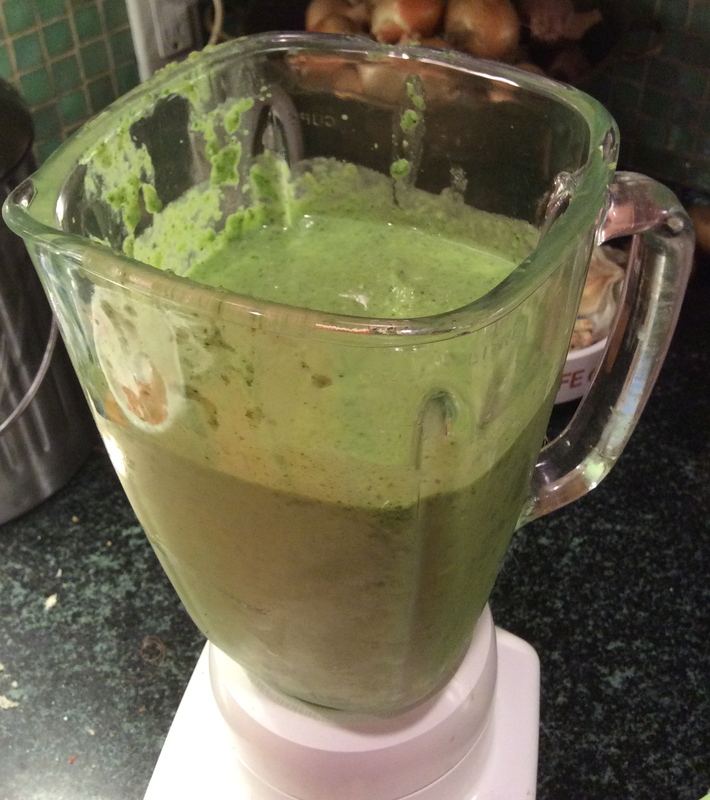 Add all of the vegetables, yogurt, one cup water, and five ice cubes to a food processor, and puree until well blended. Taste, and add salt and pepper. Because this is a cold soup, it’ll need more salt than you think, so add a little more. Put as much as will fit in the blender—if you have a normal blender, that should be about half—with half of the remaining ice cubes, and mix until it’s really creamy. Mix the other half with the remaining ice cubes and whirl that around until it’s done. Keep in the refrigerator until ready to serve. Garnish with arils and wasabi peas (or avocado chunks and something else), and serve. Anita’s right, there are a lot of ingredients here. If you don’t have nettles, you can use spinach. Or you could use some parsley or cilantro. You can leave out the olives, though I think they add a meaty texture. If you don’t have the peas, skip them. Sherry vinegar or cider vinegar work as alternatives to the wine vinegar. You can use some green grapes instead of the apple, or you can use both. Mix it up. There’s no such place as food jail—you can do whatever you want. 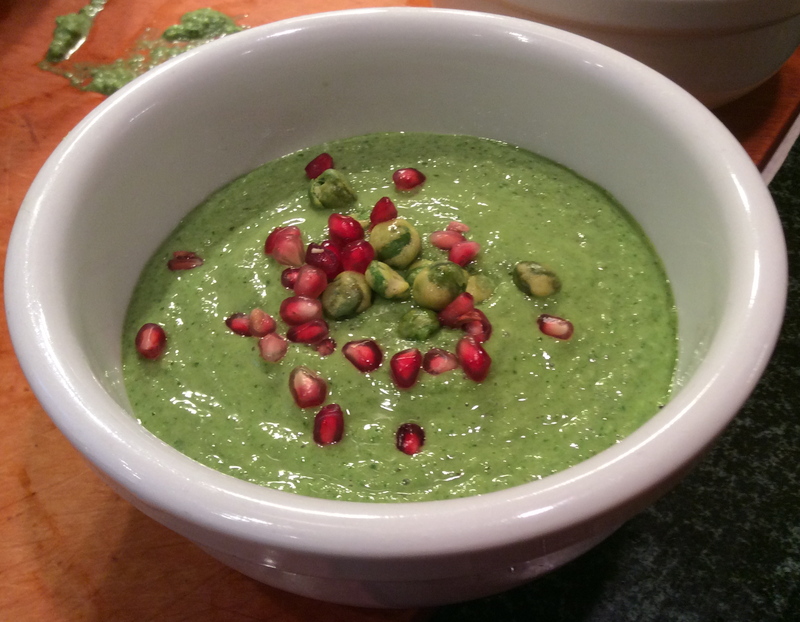 This entry was posted in Eat and tagged avocado, cucumber, Eat, gazpacho, recipe, soup, The Secret Restaurant, yogurt. Bookmark the permalink.